On Nov 7, Stompers Han Kim, Hazel and Kvale came across three unsightly scenes of litter near in their neighbourhoods and captured video and pictures, which they sent to Stomp. In the first incident, Han Kim passed by the playground near Block 403A Fernvale Lane on while she was sending her child to school at about 7.45am. She said: "I was quite shocked when I saw this in the morning. It was quite bad. "Must we have an educational video on how to clean up after a party?" She said that there was a dustbin nearby which was empty and said: "There is no excuse for the people who dirtied the place, to not be using the dustbin." She saw the mess at the void deck too. "We should not take the cleaners in Singapore for granted," she added. 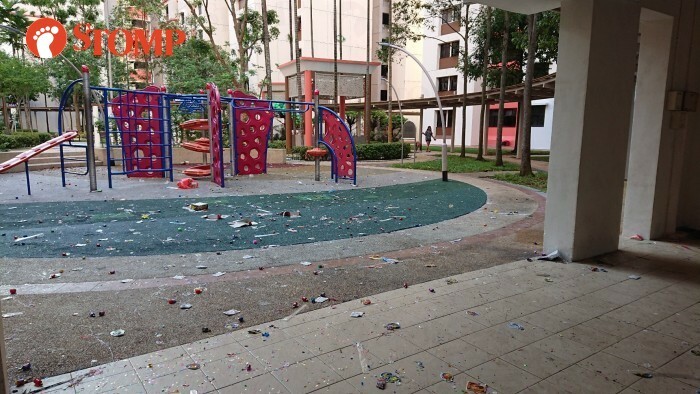 In the second incident, Hazel was at the carpark shelter of Block 560 Ang Mo Kio Avenue 10 when she also saw the playground nearby in a mess. She said that it remained messy from about 6pm to 10.30pm. She said: "It was so messy, she could not even walk. I think that they should care more about their surroundings. It may not be their concern, but this is where I live." In one of the pictures taken by Hazel at night, a small fire can be seen on a grass patch. Lastly, Kvale was infuriated when he saw the void deck of Block 257 Compassvale Road in a mess. He had heard the sound of confetti poppers for more than 30 minutes the night before, at about 8pm. 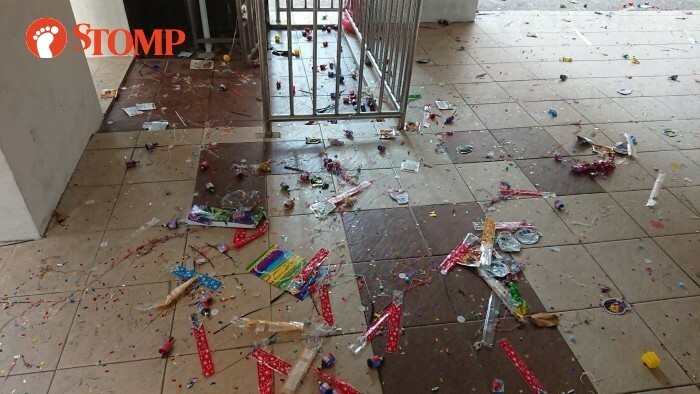 He said: "The whole void deck was covered with confetti poppers, wrappers, boxes, burn marks, streamers, glitter pieces, sparklers and other rubbish! I'm super mad seeing such a mess left by inconsiderate people." He told Stomp was even angrier as there was a cleaner sweeping up the mess. He sent a video of the cleaner and the mess. In the video, there are white stains all over the void deck. "The poor cleaner had to clean up their mess. The whole incident was so sickening. "If it was kids who played and did not know that they had to clean up, the parents should have taught them how to. "It was truly an irresponsible act."